Gristmill Studios Forum • View topic - Meteor Strike! Oh no a meteor struck near the Bot Tower! That is awesome! Quick, grab the chunks as there are collectors back on Earth who'll pay serious money for them. did that happen in the test version of the game? whats that reddish stuff in the crater? I hope that's the kind of splatter that we get. I need some Aluminum right about now. I will simply assume you made this on perhaps the 360. Looks like a real meteor hit just too bad it only holds copper and nothing like diamond. Also using the DLC blocks I see. I think the blood stone really adds to the look of it. I have no clue if GM will ever just give players that block in simply the non altered game. Shame they do not add anymore natural spawning blocks like it or just non DLC blocks that you can craft. Good job and perhaps next time it will be an asteroid that hits !!! I did not mean to Cause any Comotion which is why I posted my latest Project Converting the Current Empty Craters to some with a Bit more Flair around my base on one of my newer worlds. But on the Topic of Meteors I am Sure everyone wants to see this in the Game and be able to loot the Minerals Deposited while Hopeing that their place is left intact. I highly Doubt we will be able to get that on the 360 though. I imagine it would cost us way too much in memory to get. I am wondering however if we could get this in a Random Direction overhead. Seeing that would let us know a Large Meteor Struck Near By and maybe at the edge of Render Give us a Flash on the Horizon that it hit and just pick a Random Coordinate in that direction that the Terrain will be replaced with a Crashed Meteor in a New Small Crater. The Next Gen System that could probably handle the same thing but inside render distance would be the only difference between the two systems as they would both have the feature but handle it in different ways that they could each handle. Like maybe a Herd of Venators attacking on the XBox One and a Pair of Scouts on the 360 where both have wandering mobs but handle them differently according to their abilities. 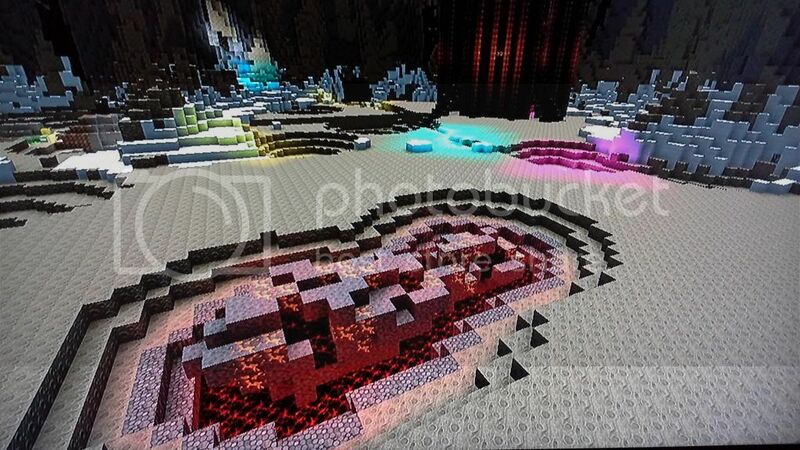 By the way yes it is BloodStone and there is 75 Copper Blocks in that Modified Normal Crater. Now that's fun idea. I like the visual research as well! Meteors were a feature we had discussed way back. They're still on the board as a to do -- but maybe not this incarnation of Xenominer. Interesting idea bush about only seeing them crash. I would think one could create an asteroid crash if done like this. The map altercations may be to much though. But the thought of having like a canyon biome turn into a big hole filled with different things from the asteroid is pretty cool. I also agree with the venators wandering around. I think the dev may have just left us a clue about something coming up soon. rrunnheim wrote: Now that's fun idea. I like the visual research as well! No it was just a little side project I messed around with while waiting for the bot to run a script. Any hints I have get posted in the Testers Corner as a heads-up relatively just before the update posts and after we get to test the New Copy.